In these type of shots, the final direction of the cue ball is approximately the same even if the aim is not exactly the same. It's a follow shot with aiming from 1/3 ball up to 3/4 ball. The final direction is aprox. 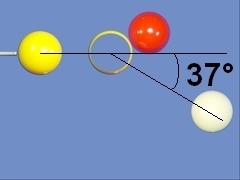 37° with regard to the axis of the cue. we can make an minor error of aiming , the resulting direction will be nearly the same.